As winter sets in, we tend to turn to warm beverages to keep us toasty and alert – because… hibernation! Most people have their feet firmly planted in either Camp Coffee or Team Tea, so when you meet someone who loves coffee, you know they have a real coffee commitment. These clever coffee hacks will not only give you some fresh new ideas on how to enjoy your favourite beverage; but there are also great tips on how to amp up the caffeine boost coffee gives you; and some awesome ideas on how to use up leftover coffee. Did you know, for instance, that leftover coffee grounds make an excellent fertilizer for both indoor and outdoor plants. Give your plants a caffeine boost once a week, but not more than that as the grounds can be quite acidic. Where should you store your coffee? Coffee beans should be stored in the fridge to keep them fresh, while ground coffee needs to be kept at room temperature and should stay out of the fridge to avoid absorbing odours. Not first thing in the morning! Allow your body’s natural cortisol to wake you up and then enjoy a caffeine boost at the optimal time, between 9:30am and 11:30am. Fresh grapefruit slows down your body’s absorption of caffeine, so you’ll maintain a buzz for longer. Have a grapefruit mid-morning with your first cup of coffee and you’ll have additional energy all day! If you love flavoured coffee try making your own syrups. Recipes for flavoured syrups abound online and they are super simple to master. The flavour combinations are endless! If you want decadent coffee put a couple of small squares of dark or milk chocolate in your mug before pouring your hot coffee on top. Instead of throwing away those half pots of coffee, use then in your baking. A chocolate cake with some added coffee is divine and extra moist, but other ideas include espresso cookie, coffee truffles and Tiramisu. 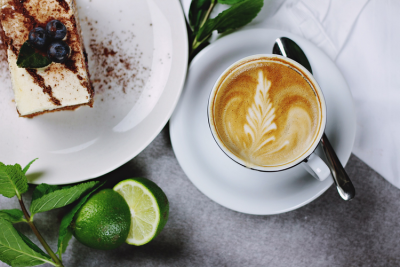 Don’t give up your coffee – instead use it in ice-creams, mocha pops and other devilishly delicious desserts!